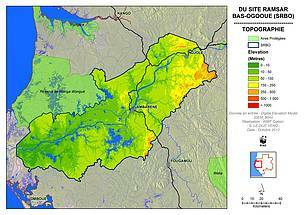 The Bas-Ogooué (Lower Ogooué) area is situated in the center of Gabon and covers 8,627km2. It contains critical wetland ecosystems. The area is exceptional in terms of animal biodiversity (elephants, buffalos, apes, mandrills, hippos, manatees, fish, birds etc. ), as well as flora and landscapes (Ogooué River, alluvial lakes, forests and flooded farm lands). Despite its status as a Ramsar site (a wetland of international importance) since 2008, it has no management framework or external support. WWF has been active in the Bas Ogooué area since 2005. The government of Gabon has asked WWF to provide technical assistance to better integrate Ramsar site management and protection measures in a national framework for sustainable management of natural resources. The WWF interventions are focused on the Ramsar site and its peripheral area. We are currently studying the recognized limits of the site, which do not include the Ogooué delta and other important areas. These should be comprised within the Ramsar site in the future, meaning that the geographical scope of the classified wetlands is highly likely to increase. 6. Conducting a census of artisanal gold mining sites.